So, with no more ado, I’m off to pick up a needle, as I’m going to try for a full 8-10 hours stitching on it today yikes! Then I have a dragon one due on 15 August, so I’d better start doing some stitching on that too afterwards so I’m not in the same predicament next month! Here’s my progress for 3 hours yesterday – which is why I’m panicking … this is only about 1/8 of the total stitching for this block, with loads of backstitching (excuse the crappy photo, as it’s not in focus – but I figure there’s no point taking another one, as there’s not much to see yet! LOL). OK, enough yapping … off to my stitching corner I go! ← I have the power!! You can do it 🙂 Don’t panic! Have you thought about putting the dates on your blog where they hit you in the face every time you blog? It works for me – it’s the only thing that keeps me remotely in control 🙂 LOL! Best of luck Ann you can get it done!!! Best of luck to you Anne. I’m sure you can do it in plenty of time though. Don’t you hate when things sneak up on you like that? I have the same issue and it’s going to cause me to stitch my little tooshie off this weekend in order to finish it completely within a week. Looks like you are zooming through this one (no pun intended), though! Sending tons of encouragement your way, Anne. I had that same feeling with my Friendship exchange last month! Oh my goodness! 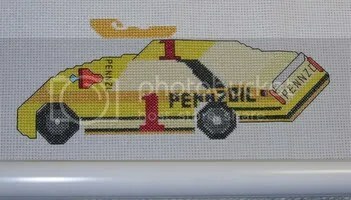 Anne is stitching a NASCAR car!! Neat! Of course, car #1 is not a Pennzoil car right now, so I am busily tryng to figure out which driver drove the #1 Pennzoil car at one time… NASCAR is big in my little world! LOL!!! I hope to marry Ryan Newman (car #12) some day – do you think Mike would mind?? Yikes! Hate those forgotten deadlines and the mad rush to get them done. Good luck! Carol… I know Steve Park drove the Pennzoil car many years ago, not sure who too over. Nice start, Anne. Goodluck with with stitching. I am sure you can do it in time. Woohooo … that needle must have been smokin’! … it looks great … good luck with meeting the deadline. Looks like you’re doing a great job – keep it up girl!